Junior kicker Jake McIntyre and holder Tom Stewart look up in anticipation as McIntyre's game-winning field goal clears the uprights. Harvard led by 16 points heading into the fourth quarter. Seven minutes later, Holy Cross led by one — its first and only lead of the night. As the clocked ticked down to two seconds, that lead remained. At the eight-yard line, Crimson coach Tim Murphy sent out his kicker to attempt the do-or-die field goal. The Crusaders’ called a timeout to ice junior Jake McIntyre. It didn’t matter. The junior booted the ball through the uprights. As he watched his kick sail between the posts, McIntyre turned toward the Harvard sideline, holder Tom Stewart threw his helmet, and the Crimson bench stormed the field, piling up the kicker. The 33-31 victory by Harvard (3-2, 1-1 Ivy) was anything but smooth. The team’s fourth-quarter woes began with a read option left to Holy Cross’ Domenic Cozier and the ensuing two point conversion that cut the lead to eight. 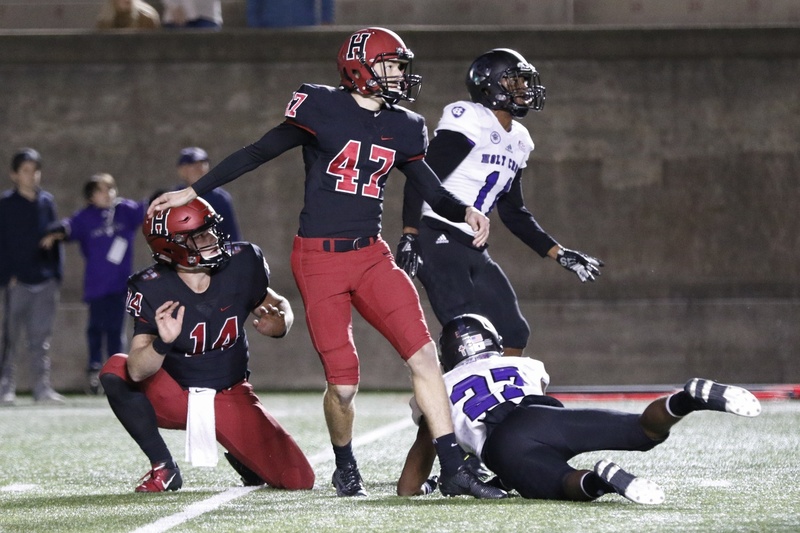 The Crimson’s special teams inefficiencies then reared their ugly head as the Crusaders (1-6, 0-2 Patriot) sent a tumbling kickoff towards Harvard’s two back returners. The ball bounced directly between them and hobbled down to the Crimson two-yard line before senior Adam Scott fell on it. Senior Tom Stewart set up to receive the snap to open the drive, feet planted squarely in his own endzone. The snap sailed over the waiting quarterback’s head and out of the back end zone — the team had allowed its second safety of the season. With its offense taking the field only one play after scoring a touchdown, Holy Cross captured all the available momentum. This time, the Crusaders earned a single first down and nothing more. The ensuing punt sailed 47 yards to Scott, landing in his arms before bouncing out and into the awaiting Holy Cross defenders, another special teams falter. The visitors capitalized. On the first play from scrimmage, senior quarterback Geoff Wade found wideout Martin Dorsey on a back shoulder fade over the top of his defender. With the successful extra point, the visitors took their first lead of the night — erasing the 16-point fourth quarter deficit in only seven minutes. Coming up big for Harvard were players whose gametime had been thus far limited. Until this week, few had heard of sophomore wideout Tyler Adams. Then he caught two of the biggest passes of the night. Quite possibly the most important play of Harvard's final drive was Tyler Adams' reception near the goal line, which drew a pass interference penalty that was ultimately declined. The Crimson began its game-winning campaign from its own 29 with 3:34 remaining to play. At the visitors’ 41, Harvard faced fourth and four. Rather than rely on the legs of his backfield, Murphy trusted Stewart’s arm and Stewart trusted Adams’ hands, tossing the pass to the sophomore who pulled it down despite his defender, John Smith, laying on his back. With a new set of downs in hand, Stewart went back to the sophomore, this time deep. Stepping into the oncoming blitz, the senior play caller got hit as he threw, tossing the pass short to an Adams in double coverage. Adams planted his foot, came back to the ball and caught the pass despite pass interference from Smith. First down the Crimson at the five-yard line. From there, McIntyre stole the show. Adams concluded his career night with a career best seven receptions for 84 yards. Tonight’s challenge represented Stewart’s second career start for Harvard after he spelled sophomore quarterback Jake Smith in last week’s Cornell game. The senior’s only previous start was also against Holy Cross in 2016, a 27-17 Crimson loss. While Stewart has been the backup through the first four contests, he played like a veteran starter tonight. The senior completed 20 of his 36 attempts for 272 yards and two touchdowns. Tonight's contest represented senior quarterback Tom Stewart's second career start, with the first coming also against Holy Cross in 2016. Overall, Harvard rushed for only four yards less. Senior and 2017 first team All-Ivy running back Charlie Booker returned to play this week, earning 31 yards on 10 attempts. Supplementing this performance was sophomore Aaron Shampklin with 128 yards on 13 carries, sophomore Devin Darrington with 32 on three carries and Tyler Adams with 33 on two attempts. The Crimson came out of the gates hot on the chilly night. In the game’s first drive, sophomore running back Aaron Shampklin waited until just the third snap to break a 57-yard sprint down the left sideline for six. 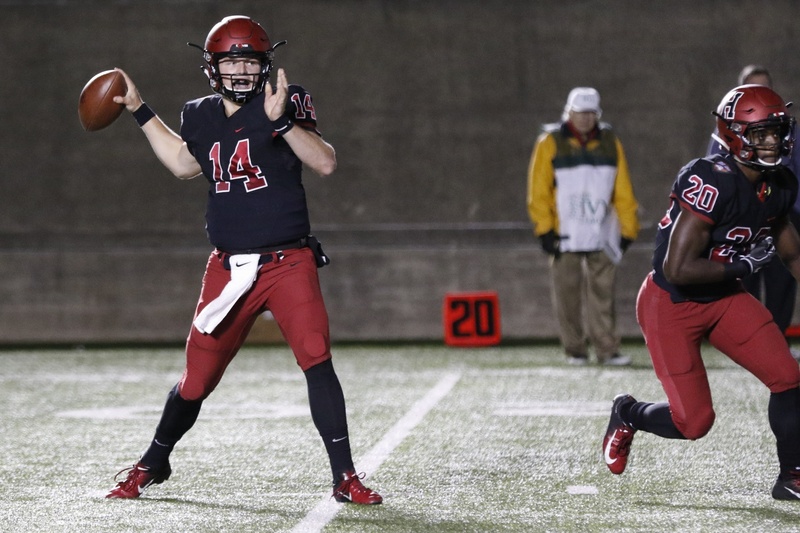 The drive concluded in an incompletion, however, as Harvard opted for a two-point conversion. The effort fell short as the backwards pass hit the hands of the receiver and then the turf. The Crimson’s second two-point effort compensated for the loss. Following sophomore wideout James Batch’s 35-yard touchdown reception, Stewart went to the air again. This time he tossed a high pass to sophomore tight end Adam West cutting across the back of the end zone. The second-year bobbled it once and pulled it down just before his knee landed out of bounds. While in football the red zone is any point within 20 yards of the endzone, tonight the “Crimson zone” seemed to lie anywhere beyond the 20. None of Harvard’s touchdowns came from within that 20-yard mark. The Crimson has struggled in the red zone all season. Only twice this season has Harvard entered the final 20 yards and left with six points — both these instances occurred against San Diego in week one of the season. 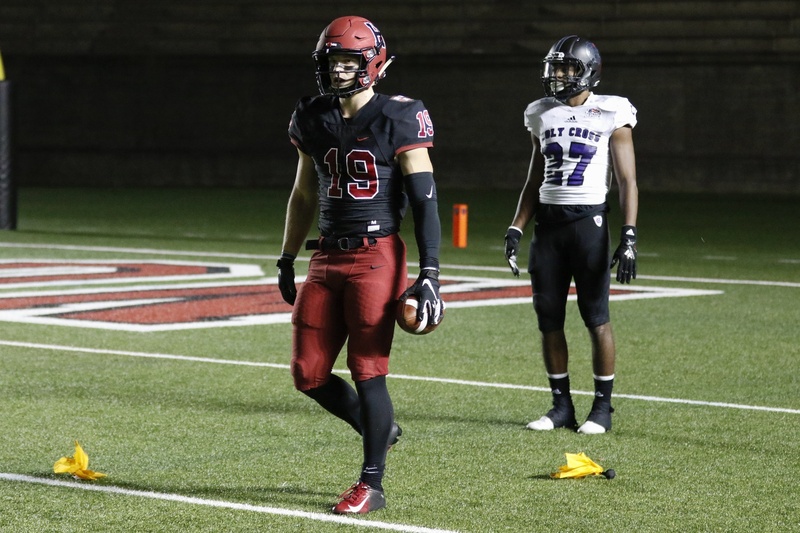 However, the Crimson’s four appearances in the red zone netted 12 points total, as McIntyre nailed four of his five tries — scoring from 34, 21, 30 and 25 yards, respectively. His only miss came on a 42-yard attempt — the same yardage as his career long set last week at Cornell. The kicker currently sits at sixth in program history for career points as a kicker. 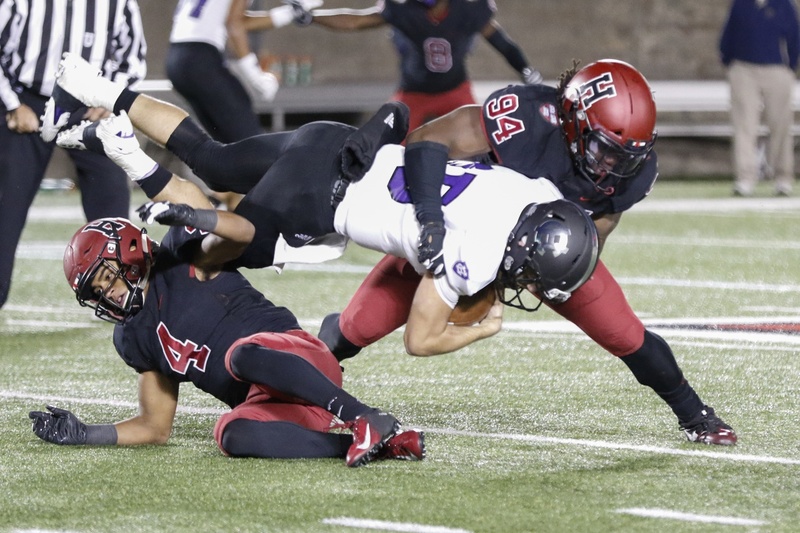 The Harvard defensive front held strong for the majority of the game, totalling four sacks for 24 lost yards and allowing only 148 rushing yards. Harvard's run defense stood out once again, as it limited Holy Cross ballcarriers to 3.7 yards per attempt. In fact, the game was only at a nine-point spread up until the last 40 seconds of the third quarter. The Crusaders’ Wade took his drop and was enveloped by a mass of blockers and defenders. Sophomore linebacker Andrew Irwin and senior defensive tackle Stone Hart punched the ball out. Crimson sophomore Jordan Hill recovered the fumble. Stewart found sophomore receiver Tyler Adams two plays later for the 28-yard score. The 16-point lead was Harvard’s largest of the night.